Craft beers are all the rage in London, with microbreweries and pubs devoted to the new golden nectar springing up like mushrooms after the rain. Now The Craft Beer Co. has found a site in High Holborn on the edges of Covent Garden to add to its pubs in Clapham, Clerkenwell, Brixton, Islington and Brighton. It will open in May. Beer from Britain, Scandinavia and America is the name of the game. The Craft Beer Co. Covent Garden, 168 High Holborn, London WC1V 7AA, no phone. Jason Atherton is spreading his wings. Not content with being appointed food ambassador for the UK by prime minister David Cameron, he’s announced May 1 as the opening date of City Social, in what was Gary Rhodes 24th floor restaurant in Tower 42. British ingredients are slated to be the main attractions, given a thoroughly modern twist by the current master. The décor is Art Deco style, albeit in a modern steel and glass block. There are rosewood paneled walls, chrome and mirrors and smoked glass with a black-steel kitchen in the center of the room. You won’t know whether to look at the chefs or at the City view. Mon.-Sat. noon-2.45pm & 6-10.30pm. City Social, 25 Old Broad St., 24th Floor, Tower 42, London EC2N 1HQ, 020-7877 7703. In the fashionable restaurant street of Exmouth Market in Clerkenwell, Bonnie Gull Seafood Cafe promises a real fish ‘n’ chips experience. From its original Fitzrovia site, the “seafood shack” has expanded, so it’s clearly hitting the right note for those with nostalgic memories of seaside holidays. There are 82 seats inside and 20 outside; a shellfish table with oysters, cockles, smoked mussels and langoustines all served, quite rightly, in newspaper; and a main restaurant getting more serious with the likes of grilled crab and beer-battered haddock with beef-dripping chips and mushy peas. Lunch & Dinner daily, Brunch Sat.-Sun. Bonnie Gull Seafood Cafe, 55-57 Exmouth Market, London EC1R 4QL, 020-3122 0047. The latest offering from the Goodman group, which has steakhouses in London and the Burger & Lobster chain, opened on May 6, 2014. Beast is in One Chapel Place, a major redevelopment site just north of Oxford Street. The restaurant serves steaks and whopping Russian king crabs accompanied by top wines. Beast, 3 Chapel Place, London W1G 0BG, 020-7495 1816. The Palomar in Soho serves food inspired by the old Levant mixed with modern touches, interpretations and techniques. It’s the brainchild of Layo and Zoe Paskin, while the chefs come from Jerusalem’s Machneyuda restaurant. The setting --- designed on the classic 1930’s idea of travel as a romantic adventure --- has a marble raw bar, a 19-cover bar with an open kitchen, and a small 35-seat dining room at the back. The cooking is eclectic, combining dishes using Japanese techniques with Moroccan flavours as well as signature selections from the Israeli original. The Palomar, 34 Rupert St., London W1D 6DN, no phone. Chef Simon Rogan’s Fera at Claridge’s has opened. Fera means “wild” in Latin, and in this case reflects Rogan’s obsession with foraging and wild ingredients. 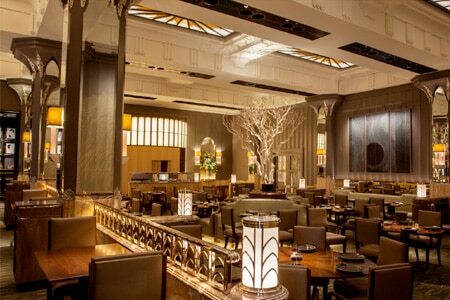 It was designed by Guy Oliver who has worked extensively with Claridge’s and has kept the Art Deco interior. With 90 covers and a private dining room for 12 guests, the restaurant offers à la carte menus as well as a set lunch and two multi-course menus. Fera at Claridge's, Claridge's, Brook St., London W1K 4HR, 020-7107 8888. Hip restaurant Floridita is offering a Salsa Session on Tuesday nights, when participants can learn all the moves and twists that keep you fit. And to make sure you’re doing it right, you learn from “Cuban Fury” and British TV’s “Strictly Come Dancing” choreographer Richard Marcel. Whether you’re a complete beginner or just want to improve, this is the place. Dance first, then dine on modern Latin American and Cuban cuisine. 3-course menu at £45 including a mojito cocktail and 45-minute salsa session, or £20 for a salsa class and cocktail. Each Tuesday: 6:30- 7:15pm for beginners and 7:30-8:15pm for intermediate dancers. Floridita, 100 Wardour St., London W1F 0TN, 020-7314 4000. Raymond Blanc, of Le Manoir aux Quat'Saisons in Oxfordshire, has announced he will be opening a restaurant in London. He’s not revealing the address, but it seems that it will be an upmarket establishment. After a somewhat chequered career, John Burton-Race is returning to London with The New Angel (a reference to his former Devon restaurant, The Angel). Setting up in Notting Hill’s Chepstow Road, the 54-cover restaurant will offer a contemporary European menu plus a varied wine list. He’s a talented chef so this will be an interesting one. The New Angel, Chepstow Rd., London, UK W2 5BP, no phone.